At 27, John Rutherford played Test cricket for Australia. At 31, he suffered a stroke during a tour match against the West Indians in Perth, and never played first-class cricket again. At 85, he still puts on his whites and baggy green at least once a year, on Australia Day, and sometimes even has a bat. He is used to beating the odds. Rutherford played only one Test, but that in itself was a remarkable achievement in 1956, when to be from Perth was to be considered a second-class citizen in Australian cricket. Western Australia played only half as many matches as the eastern states in those days, their players viewed as irrelevant to national selection. But a headstrong attitude meant Rutherford wouldn't give up. It is a quality that remains with him. 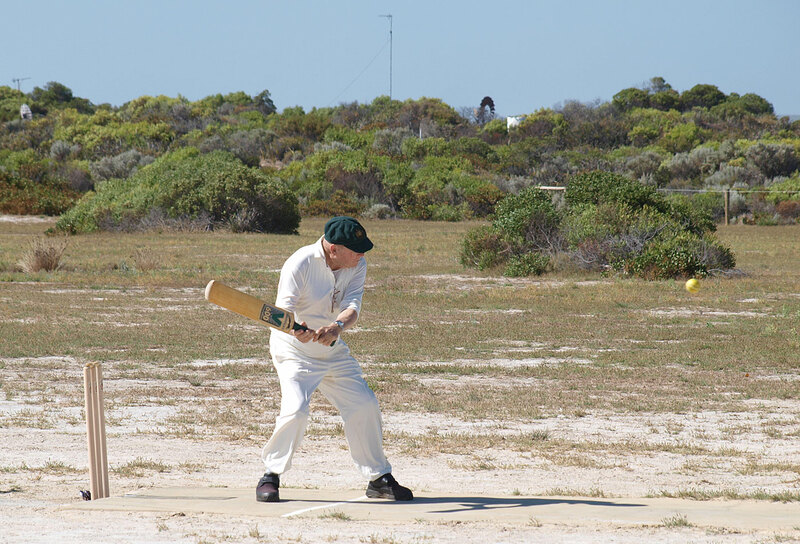 Each year on January 26, a social cricket match is played on Wedge Island in Western Australia, and Rutherford travels from his home in Lancelin to be the guest of honour. Last year he made 3, and he was keen to have another hit this year. But he wanted to do it right. "I found a net in Lancelin, and I found a fella who could bowl to me," Rutherford says. "I found that I'd lost the ability to match up the ball and the bat. My daughter, who is a doctor, said I could get it back if I was to do enough practice. I haven't got anybody around here to do that with me. But I still go to Wedge, get all my whites and I wear the baggy green, I toss the bat for who bats first, and have a jolly good time." And why not? Life could have worked out far worse for Rutherford, who 55 years ago was captaining Western Australia against Frank Worrell's West Indians when he suffered a stroke and had to be helped from the field. It was a difficult time for Rutherford, who also worked as a maths and science teacher. "Everything was going against me," Rutherford says. "I had trouble with my wife, who had cancer in the eye and had to have her eye removed. Then I had people here thinking I should be in the Australian XI, and I wasn't. I just reached a stage where the whole body said 'enough'. I never played first-class cricket again. "About eight weeks after I had the stroke, I had to go back to teaching. I couldn't write. Before that I would put work on the blackboard, now I couldn't do anything on the blackboard. The first year after I'd had the stroke, I would face the class and talk to them. But now I was in a position to see that kid with the compass, about to jab it into somebody else! It worked out that I was a better teacher than before I had the stroke. My results went up 15%!" You'd trust him on the percentages. On the way to England in 1956, Australia's players were invited to the ship's bridge, nothing but water in sight. Keith Miller wondered out loud how far it would be to the horizon. Rutherford responded: "Well, do we know how far we are above the water?" A crew member worked out their elevation, Rutherford pulled out his travellers' cheques and drew a diagram on the back, calculating the distance to the horizon. "Miller says, 'Christ, we've got bloody Pythagoras on board!" Rutherford recalls. "Well, I did have a degree in maths." "The first year after I'd had the stroke, I would face the class and talk to them. Now I was in a position to see that kid with the compass, about to jab it into somebody else"
The eastern states were the traditional bastion of Australian cricket, Western Australia the poor cousins thrown a few token Sheffield Shield matches each year to keep them happy. In 1954-55, Western Australia's entire Shield season consisted of one home fixture and one away, both against South Australia. Rutherford made centuries in both games. Then came 1956 and with tours of England, Pakistan and India approaching, the national selectors decided they'd better have a look at Rutherford. He was asked to come to Sydney for a testimonial match, at which he would effectively be competing with Les Favell of South Australia and Sidney Carroll of New South Wales for a place on the tour. "I got on a plane, went across to Sydney. Nobody to meet me," Rutherford says. "Fortunately I'd made a note of where the fellas were staying. I got a taxi. There were no cricketers there. They had a practice on down at the SCG. It was the first I heard of it. I got my pads and bat and jumped in another taxi and went down to the SCG. "I said, 'We've got some funny ideas over in Western Australia. We find if you have your name on the list, you get a hit, but obviously you've got some rule over here that the last one gets wiped off. Piss-poor idea but I guess I'll get used to it.' He said, 'You haven't had a hit? I'll bowl some to you.' So my look at Ray Lindwall bowling the first ball to me the next day was to have the second Australian wicketkeeper throwing me donkey lobs. I tell you what, I was bloody annoyed." That was just a taste of what was to come. Rutherford made 113 in that game and was chosen for the tour, but it was assumed that being from Perth, the end of the earth in the minds of cricket administrators, he could wait until the ship arrived in Fremantle before joining the rest of the team. Never mind that the squad was to play two games in Tasmania before even getting to Perth. Rutherford put his case to join the tour from the start. The Victorian secretary of the Australian Board of Control told Rutherford there were 40 openers in Victoria who were better than him and that "nothing you say is worth anything until you've been in the side, god help us, for five years, and until then you eat the crumbs that fall from the master's table". Rutherford was unimpressed, and unintimidated. "I said 'Are you finished? I'm going to go over your head.'" He did. He appealed to the captain, Ian Johnson, and selector Don Bradman, and his wish was granted. Of course, nobody had thought to book him into the team hotel in Tasmania, so he relied on the generosity of room-mates Neil Harvey and Maddocks to have a third mattress brought into their room. Life wasn't easy as the sole Western Australian on a long tour. One day, someone started complaining about the Perth umpires, and said you had to get Rutherford out three times before the local umpires would give him out. Rutherford, a self-confessed "smart-arse", couldn't help himself from biting back. "I said, 'Let me tell you something. The weight of cricket in Australia is changing. It's coming over to Western Australia. And before we've played many more Tests half the side will be from Western Australia, so you'd better get used to the way we talk.'" Rutherford was more or less right. Within 15 years, Western Australia produced some of the country's most outstanding Test cricketers, men like Graham McKenzie, Dennis Lillee and Rod Marsh. 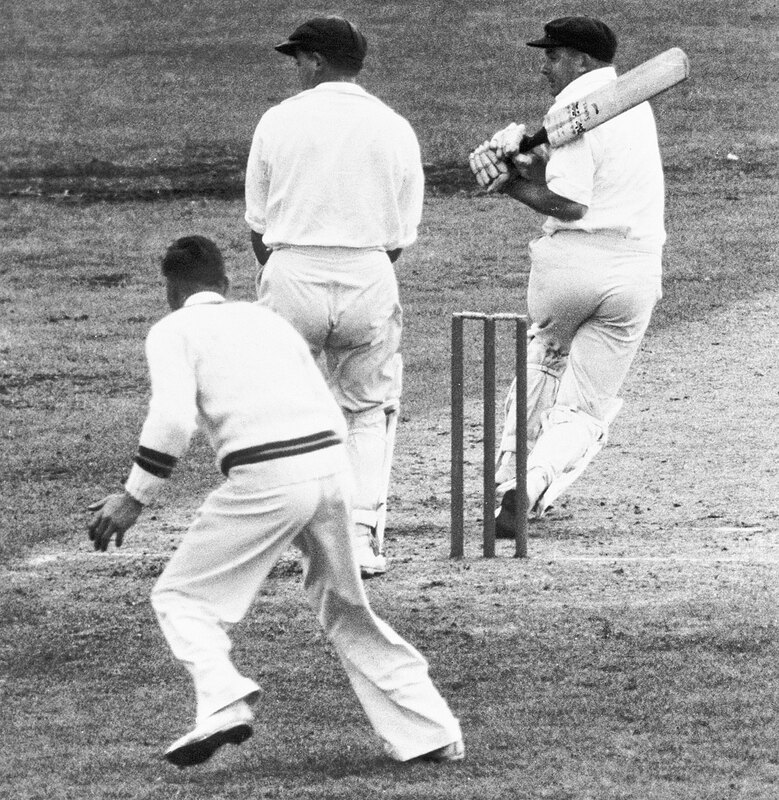 But Rutherford himself was destined to play only one Test, against India in Bombay on the way home from England in 1956. "I opened with Jimmy Burke. We put on about 57 when I got out caught behind. Burkey made 150  and we made about 500. We ran up against this fellow who we couldn't get out, Vijay Manjrekar. They pulled me up from fine leg and said, 'Have a go.' I rolled a couple of balls down and clean-bowled him. It comes to the end of the over and they said, 'Back you go to fine leg.'" As a result, Rutherford finished his Test career with a bowling average of 15. He was not chosen for the next tour, to South Africa in 1957-58. He continued to rack up the runs for Western Australia, but then came his stroke. He returned to the country town of Merredin - he had been born nearby in Bruce Rock - and taught at school, and played some local cricket with success. Now he finds himself the seventh oldest living Australian Test cricketer, behind Arthur Morris, Maddocks, Ken Archer, Harvey, Colin McDonald and Alan Davidson, all names that are far better known than that of John Rutherford. But he looks back with pride at being the 204th man to play Test cricket for Australia. "It's made a colossal difference to me," Rutherford says. "As soon as I say I've got a baggy green, up goes people's attention. It's helped me quite a lot in a number of ways. And I was very fortunate in getting eight months with the Australian XI; guys like Miller and Lindwall, I was with them all the time. What chance did I ever really have of being the first Western Australian to play Test cricket for Australia?" What chance? A maths teacher could probably work that out. And this maths teacher learnt that no odds are ever insurmountable.